From the West Side to the East Side to the core of the city, the former industrial city on the Cuyahoga has ethnic enclaves, exciting eateries, fantastic nightlife, and world-class entertainment with a Midwestern mindset. Visit the West Side Market, perhaps the finest market in the country and one of the best anywhere to try a number of delectable treats only found in the city. Little Italy still has bakeries, shops, and great restaurants and caters to the still strong Italian community. Embrace eastern European heritage in Tremont and don't forget to check out one of the Food Network stars restaurants and favorite haunts. The rock and roll hall of fame is in the heart of the city where great food and drink and entertainment can be had almost anytime. what does it mean to be a Culinary and Cultural focused event and team building company? Although we are a full service event planning firm, the majority of our events and team building activities with whenever possible, local Cleveland food and drink. The addition of culinary to our events and team building, brings in added elements that enhance the overall experience, including the depth, complexity, and intrigue of our products. It also provides a viable and popular alternative to traditional events and team building, for groups both large and small. Our products and activities are available throughout the Cleveland metropolitan area, including downtown, Ohio City, Tremont, Little Italy, Detroit Shoreway, University Circle, the Flats, as well as the surrounding suburbs. Our goal is to be convenient to your group or meeting, to increase convenience whenever possible, while offering the best possible value. Our offerings are split into several categories, each featuring a number of different activities. Please contact us by email or phone at 216.395.0132 for more information. It all starts with the concept. Led by our Creative Director, and supported by our event planning staff, all of our products are created to be customizable for your group. We create products based on your needs, requirements, and standards. From working with an array of interesting Cleveland venues throughout the city, to supporting a strong staff of local event managers, guides, chefs, emcees, mixologists, operations managers, ready to execute an unforgettable event, tour, or to facilitate bonding during our team building activities. With nearly a decade working with clients, we have built a strong archive featuring hundreds of events, customizations, and variations for groups of all sizes and budgets, both corporate and noncorporate. We are also happy to create a completely different event for your group as well. Our offerings can also be combined with meeting space, motivational speakers, meals, non culinary events, spousal activities, transportation and more to create full day and multi day itineraries. Our culinary focused team building activities are created to offer a more comprehensive team building experience, incorporating tastes and smells throughout the activities. The benefits of corporate team building activities are extremely important; facilitating bonds between individuals (whether in the same , enabling greater collaboration, increasing morale, and standing up new organizations, increasing communication, and much more. New hires can get to better know their colleagues. Management can connect with their subordinates, and different departments can can become better acquainted. The benefits have shown to bring tangible results, such as employee retention and increased revenues. Culinary corporate team building introduces additional interactive elements, such as taste and smell. 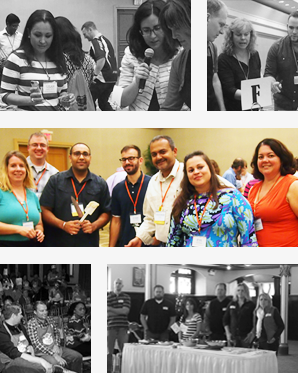 The ideal corporate team building activity is interactive and fun, yet can simultaneously offer real learning and growth for groups. We work to ensure all our Cleveland team building events provide tangible results while keeping within your group constraints, including time, budget, and location. Team building activities, with only minor modifications, can be excellent events for non corporate groups, including family reunions, bachelor and bachelorette parties, wedding receptions, groups of friends, and more. 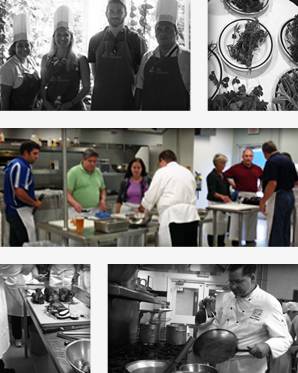 The culinary challenge series features a number of lightly competitive team building activities. In essence, groups are assigned into smaller teams, where they work together and create and present a dish or drink for the judge within a particular time frame. Utilizing the 4Lobe Mobile Kitchen setup, culinary challenge venues are available throughout the greater/ Cleveland metro area. The team building event can be run for as few as 8 and up to a thousand. Learn techniques, styles, and create a fantastic dish with the support of well trained chef, and with one of our hands-on cooking classes. During the class, you will learn in a step by step manor to execute a specially created recipe that can have a predetermined theme. 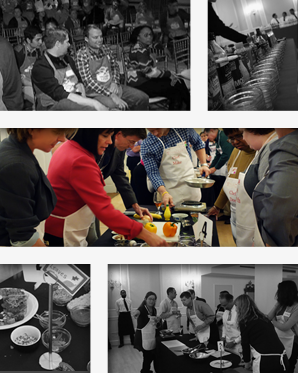 Our Cleveland cooking classes offer groups and individuals the opportunity to learn new techniques, create a variety of dishes in a fun, interactive team building event. Cooking classes are ideal opportunities for corporate groups to unwind, work together (if desired) and use simple, effective techniques to cook your meal. We utilize the 4Lobe mobile kitchen setup to offer flexible setup for groups of all sizes, and to make the event convenient for conventions, and large groups, both corporate and non corporate. 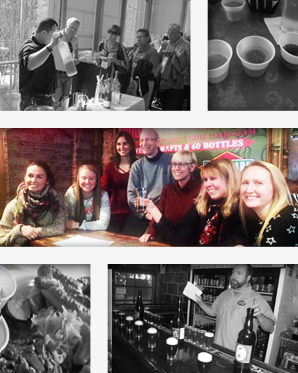 By working closely with sister company Taste Cleveland Food Tours, we are able to offer you all the products available by the award winning company, including Dine Arounds, Food Tours, Single Restaurant Dine Arounds, Pub Crawls, Progressive Dinners and more. Iconic three hour fully guided historical, cultural, and architectural walking tours through some of ClevelandÕs vibrant neighborhoods. Enjoy specially created dishes and drinks at 4 establishments throughout the event. Meet chefs, managers, and restaurateurs, and learn from both about the history of the building and restaurant, as well as the dishes you are having. Typically you receive tapas style plates or enjoy a selection of food family style settings. These food tours substitute sit down restaurants with additional stand up samples provided from restaurants. Groups visit more locations (6-8) but have less food at each, and have to eat on the go. It is an excellent budget for groups on a budget, or groups that want to see and taste as much as possible. Hybrid tours combine both the food tour and tasting tour for more stops and variety with a combination of dishes at sit down restaurants and tastes at tasting tours. The Cleveland Dine Around is a customizable, versatile food tour that brings groups to three rather than four (or more) acclaimed establishments. Enjoy multiple courses or family style eating depending on the Dine Around. Beer, wine or cocktail pairings are available to enhance the experience. 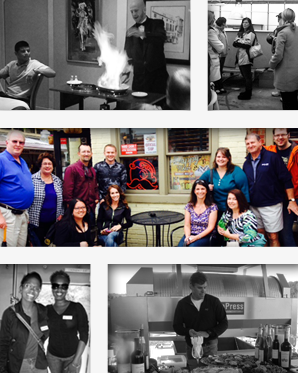 We offer chef lead Dine Arounds or culinary tours on demand for those interested in a very unique and fun experience. A popular option for conventions, very large corporate or family groups, the Single Restaurant Dine Around works with various restaurants, setting up multi course meals with options for entrees and drinks. Guests can choose the type of food they want, and sign up for the restaurant that fits their needs best. ; we take care of transportation, logistics and on bus guides if of interest. We work with sister company Welcome Cleveland to offer more comprehensive solutions for your group if you need more than events and team building activities. As a boutique Destination Management firm, Welcome Cleveland provides all the DMC aspects needed to accommodate groups, from airport dropoffs and pickups, transportation, accommodation, logistics, itinerary development, non culinary events, meeting space, meals, evening events, team building, and more. As a culinary and cultural driven Destination Management Company, we bring a modern approach to the industry, where the culture of Cleveland and Northeast Ohio is explored. There is an emphasis on the area, including the food, drink, architecture, and history. Since there may not be much time to explore cleveland, we bring it to your group throughout your visit. For individuals who have not spent much time in cleveland, to those who are locals, the emphasis on the region can make events more memorable, and help distinguish Cleveland as a vibrant, cosmopolitan city. 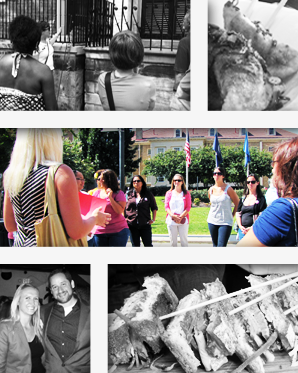 Our events and team building activities can be offered in venues nearly anywhere, while tours are run in specific neighborhoods citywide. We are able to create new tours or tour based team building events in additional neighborhoods with enough advance notice. Victuals is an interactive reception alternative that combines elements of a food tour and a culinary event with a standard reception, offering a way to transport guests into a specific (or several) region, neighborhoods, city, or country. The event brings a classic themed ÔstationÕ based reception to the next level by offering dishes and drinks that celebrate the specific region or regions, either by the restaurant itself, or faithfully recreated. An emcee hosts the event and tour guides help to bring individuals to areas, and recount stories. Victuals can be themed in many ways, focusing on local, regional, or national areas. The food and drinks are customized and help along with the guide to take guests on a journey. Contact us for more information, pictures, and videos on Victuals or any of our events and team building activities!